What Should I Know About Mammograms and Breast Density? Breast density refers the relative proportions of fat vs. fibrous and glandular tissue in the breast. Because fat is less dense than other breast tissues, breasts containing a relatively small proportion of fat are considered dense. While dense breast tissue is more common in younger women and women who are at or below a healthy weight, older women and those who carry excess fat in their bodies can also have dense breasts. 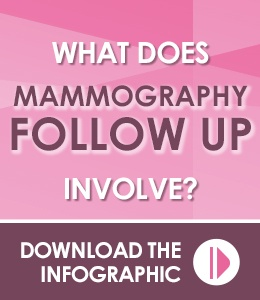 The only way to know for sure is by using mammography or other breast imaging technology. Why should I care whether my breasts are dense? Having dense breasts is correlated with an increased risk of breast cancer, although the reason for this correlation is unknown. Additionally, dense breast tissue can mask breast cancer on a mammogram, making it more difficult to detect. For this reason, healthcare providers sometimes recommend additional imaging for women with dense breasts. By understanding your own breast density as well as other risk factors, you can better participate in informed conversations with your doctor about what kind of breast cancer screening regimen is best for you. How can protect my health if I have dense breasts? A number of factors influence an individual’s risk of developing breast cancer. Whether your breasts are dense or not, one of the most important things you can do to reduce your risk of dying of breast cancer is to catch any developing cancer early. As a result, Iowa Radiology joins the American College of Radiology and the Society of Breast Imaging in recommending annual mammograms beginning at age 40 for women at average risk. According to the National Cancer Institute, randomized controlled trials indicate that women aged 40–74 who undergo mammography screening experience a 15–20% lower rate of death from breast cancer. 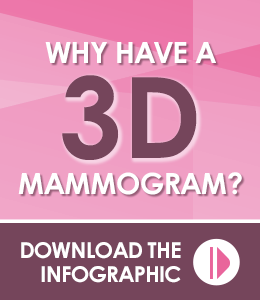 Choose a mammography facility that uses 3-D mammogram technology. A large study published in JAMA in 2016 showed that use of 3-D mammography reduced false positives while increasing detection of invasive cancers, with the largest gains seen among women with dense breasts. Because 3-D mammography uses of a series of images taken from numerous angles, it makes it easier for radiologists to see “around” dense tissue to identify abnormal structures. Make a plan with your doctor. Talk to your doctor about your overall breast cancer risk and what type of screening program is most appropriate for you. Your overall risk and screening recommendations will be influenced by your personal and family medical histories as well as lifestyle factors such as alcohol consumption and genetic predisposition. The World Cancer Research Fund estimates that 20% of cancers diagnosed in the US are preventable through proper diet and exercise and moderated alcohol consumption. The American Cancer Society recommends getting least 150 minutes of moderate exercise or 75 minutes of vigorous exercise weekly, eating at least 5 servings (2 1/2 cups) of fruits and vegetables per day, and limiting alcohol intake to one drink per day. Iowa Radiology is an American College of Radiology-certified Breast Imaging Center of Excellence and have fellowship-trained breast specialists on staff. We use cutting-edge low-dose 3-D mammography to get the best possible images and provide the most accurate results for women of all breast densities. For those who need additional imaging, we also provide breast ultrasound and MRI as well as imaging-guided biopsy when needed. Click here to schedule your screening mammogram, or click any of the images below to learn about mammography and follow up. "Breast Density on a Mammogram." Komen.org. Susan G Komen, 28 Oct 2016. Accessed 13 Oct 2017. "ACR and SBI Continue to Recommend Regular Mammography Starting at Age 40." ACR.org.American College of Radiology, 20 Oct 2015. Accessed 13 Oct 2017. "Breast Cancer Screening PDQ." PDQ Cancer Information Summaries. National Center for Biotechnology Information, U.S. National Library of Medicine, 3 Oct 2017. Accessed 13 Oct 2017. Rafferty, et al. "Breast Cancer Screening Using Tomosynthesis and Digital Mammography in Dense and Nondense Breasts." JAMA. American Medical Association, 26 April 2016. Accessed 13 Oct 2017. "ACS Guidelines on Nutrition and Physical Activity for Cancer Prevention." Cancer.org. American Cancer Society, 11 Jan 2012. Accessed 13 Oct 2017. "Summary of the ACS Guidelines on Nutrition and Physical Activity." Cancer.org. American Cancer Society, 5 Feb. 2017. Accessed 13 Oct 2017.